What is Atom and why it is awesome? Atom is a hackable text editor. 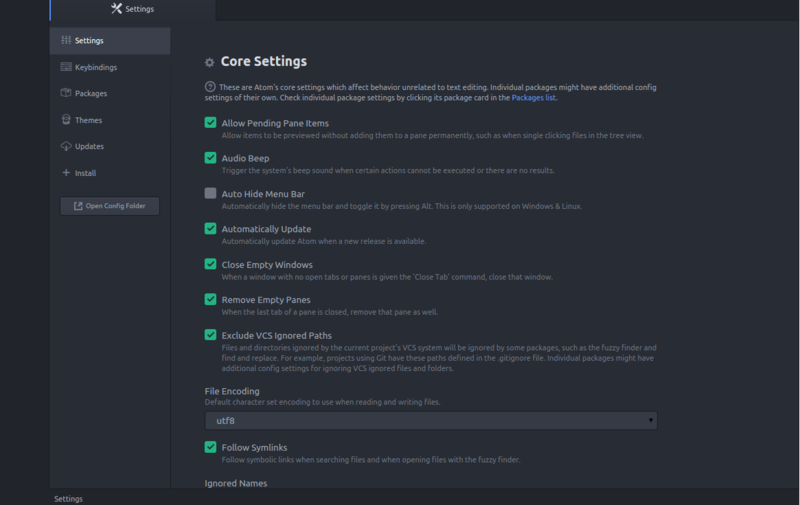 I normally don’t like the idea of text editors which need settings and different plug-ins installations to be some what equivalent to a complete IDE but after using Atom with some configurations and plug-in installation, my opinion is changed. What now I think is that a hackable editor is actually good because it provide you option to only have functionality what you exactly need while still being very light-weight. I came to Atom from Netbeans, when it became very slow and made overall system very slow. I never liked Netbeans’ non-smooth fonts on Ubuntu but didn’t find any good option. But after slowness issue, I tried Atom as text editor and then found it much more powerful by utilizing packages available. So now I use it for PHP development with useful features without making my system slow. Please note that these packages will not make it equivalent to a premium tool like “PHP Storm”( in fact never compare other IDEs with JetBrains’ IDEs unless you don’t want to pay 100$+ for IDE. ), but still Atom with packages will be better experience in many ways as compared to other editors and IDEs. If you are currently using some text editor like notepad++ or brackets, or tools like Aptana or Eclipse, you will like Atom with these packages. And obviously your system will feel much better if you are coming from Netbeans. Simply go to https://atom.io/ and download the build for your release and then simply install it. It don’t have any hard dependency like Netbeans need JRE. By just installing Atom, you can start using it as a simple text editor with smoother fonts and awesome themes. Most of PHP developers also need to interact with JS and front-end. So you will want JS support as well. Atom come with some JS related packages already installed with Atom. then go to settings provide path to php-cs-fixer and PHP. Also click on “Execute on Save” check box so that on save, it will format it according to psr2 standards. Install this package so that your Atom know in case of any PHP syntax error you make. It will show you proper error within your editor. This is very important unless you used to write PHP in conventional text editor. It will work without any further settings if your php is accessible globally through command line. Otherwise you will need to provide PHP executable path in this package’s settings. Hyperclick provider for PHP. Open file when classname is clicked. This is simple and very useful package but installing it alone will not work. So you will also need to install dependency that is Hyper Click (another package of Atom). In case if it don’t work with “ctrl+click ” then try “alt+ctrl+click” . These are just few packages that I have installed and made my Atom editor better, at least I no more miss Netbeans (which I was using for last ) for doing some work in modern framework like Laravel. But I expect a lot of more awesome surprising packages other than these. So keep exploring and let me know about your favorite atom packages in comment. Installing MongoDB Driver (with MongoDB extension) on Ubuntu and other Linux distro. I found this article very helpful in setting up Atom for PHP. Package fabpot/php-cs-fixer is abandoned, you should avoid using it. Use friendsofphp/php-cs-fixer instead. Thanks for pointing out, I have updated article as well. Hi, I really dont understand how to install this “$ ./composer.phar global require friendsofphp/php-cs-fixer”. Is it on command prompt or something else. Yeah this nees to be run through command line. I also use Atom. Consider atom-alignment and change-case packages too; they can come in handy. Sure, I will try them as well. Thanks Sam. What about code refactoring and auto complete? These are day to day basis essentials. Thank you had struggled to get any other PHP formatting packages to work in Atom. Nowadays, I am using VS Code only because, Jeffrey Way shared some good tricks on laracasts about VS Code. However, it has its own cons as well. I actually moved away from PHPStorm to Atom. PHPStorm is way too bloated and clunky at this point. It felt like having to break out the mission control manual to do almost any simple task. Atom.io, is straight forward, and throwing on packages as you need features seems like a much more organic way to learn an IDE. Yeah, but this depends on person. Some people don’t like to experiment with different packages.